I am constantly on the look-out for the perfect Tahoe backcountry insulation layer. Tahoe has its own peculiarities and conditions, namely the refined balance between relatively “warm” cold temps and high water content snow, so it is difficult to find a great match. For an insulation piece to become a core piece for the pack, it must be warm when wet, light, durable, and compact. Down is always a great option, but for Tahoe, you need perfect conditions for this – fine if it isn’t snowing, raining, or anything in between – zero precip in the forecast. A number of other synthetic insulation products work, but they tend to be heavy and bulky. 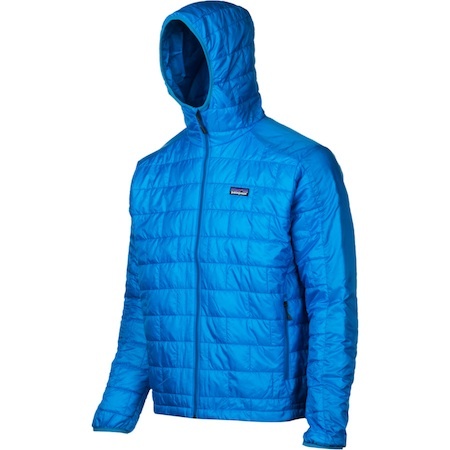 This season I have been using Patagonia’s Nano Puff Hoody as my daily backcountry insulation piece, and I am very impressed. First day I wore the Nano Puff was just a classic Tahoe day: deep early season snow pack, during the middle of a storm with fat, wet flakes, racking up laps on the local backcountry shot. There was a lot of moisture, a lot of wind, a lot of sweat. Perfect. After skinning up for lap two, we stopped at the top for a bite and some hot drinks. I put on the Nano and then a hard shell. We spent some time hanging out, relaxing before the down … before others started saying let’s get moving, I am cold. I left the Nano on, skied down, stayed nice and toasty… down at the bottom, skinning up again, the Nano was damp, a lot of moisture caught between the body and the hard shell, but I was really nice and toasty. Wow. Cannot believe this thin little jacket delivers so much warmth. Afterward, shells off, hanging at the cars, still warm, jacket drying out, unbelievable. The jacket stands on its own for a straightforward, light-weight insulation piece. This jacket works great for Tahoe, combined with other layers or on its own if not super-windy, and where our cold temps are not really that cold. The weight/insulation are a perfect balance, great warmth and great warmth despite our wet snow and climate. The Nano Puff utilizes Primaloft 60g insulation. Shell is made from recycled polyster and can be returned to Patagonia to be recycled again after is long useful life. As a sole insulation layer in much colder climates, e.g. Colorado, Utah, other spots where it does get really cold at times, The Nano is a great mid-layer, something to use in combination with a shell, or a layer that provides extra warmth during aerobic and can handle the sweat. The Nano Puff is also light and compact enough that even if it is a beautiful, dry day, I take it with me, just in case something happens and I need to spend some time dealing: an accident or injury, a broken binding, etc. Once in the pack, you forget about this jacket until you really need it, and then it delivers in multitudes. Windproof and water-resistant, the full-zip Nano Puff® Hoody is made with warm, incredibly lightweight, highly compressible 60-g PrimaLoft® ONE insulation, and is ideal as an insulating layer or outerwear in cold climates. When missing the sunset curfew means climbing through spindrift rivers into the night, the Nano Puff® Hoody shines. It serves triple duty as an insulated jacket, a thermal midlayer and a sleek micro-belay parka on quick alpine dashes – sometimes all in the same day (or night, when the dash isn’t so quick). The elasticized hood opening snugs over low-volume helmets or under any helmet, adding thermostat-like warmth. The wind-blocking, moisture-shedding 100% recycled polyester shell glides effortlessly in your layering system, and low-bulk, hydrophobic, highly compressible PrimaLoft® ONE (60-g) traps heat with remarkable efficiency, even when wet. The hoody packs down to practically nothing and stuffs into an internal, zippered chest pocket that has a carabiner clip-in loop. It also has two zippered handwarmer pockets, quilting to stabilize the insulation, elasticized cuffs and a dual-adjust drawcord hem to seal out wind and seal in warmth. The human body uses energy to keep warm. PrimaLoft® uses a patented microfiber structure to help the body retain warmth and conserve energy. Available as PrimaLoft ECO or PrimaLoft One.